The altE Store started designing and selling grid-tied solar systems way back around the year 2000. Back then, a typical solar system was about 500W. Nowadays as the price of solar panels drops, the size of the solar array rises. A larger solar array requires a larger inverter. Now 10,000W inverters and larger that used to be reserved to commercial solar systems are now becoming commonplace in residential. Once solar inverters get larger than 7680W, installers often will run into a restriction from the National Electric Code (NEC) that needs to be addressed. This restriction has become known as the 120% rule. We are going to explain the rule, and cover ways to deal with it. 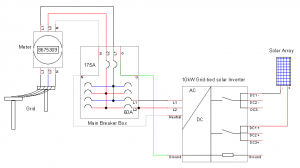 The most common way to connect a residential solar system to the grid is in the main breaker box through a new dedicated breaker, as shown in the schematic. 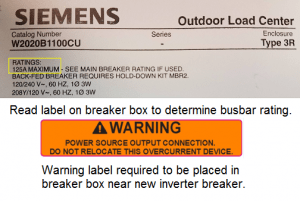 To determine the rating of your main breaker box, read the label on the box. It will tell you its rating. In the photo of the label, I have a 125A busbar in my main breaker box. Then look at the big main breaker in the box, looking at the photo of the Main Breaker Box Components. I have a 100A main breaker. Then looking at that photo again, you can see I have a 30A 2-pole breaker at the other end for my solar inverter. 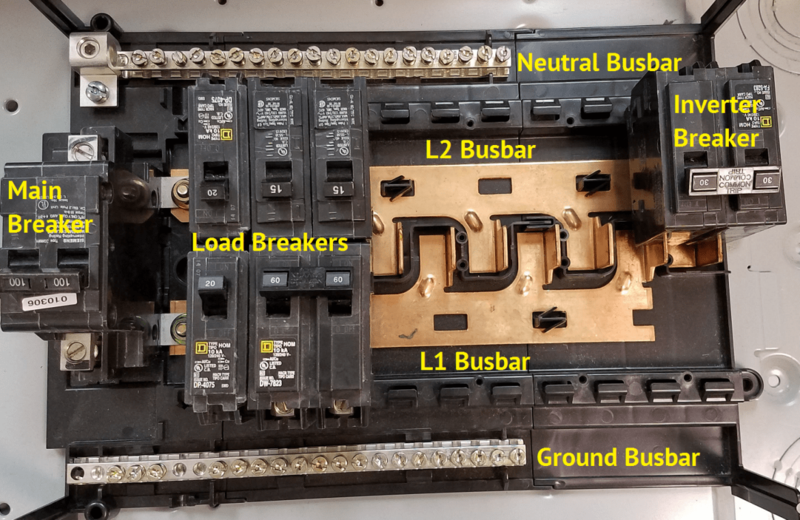 NEC705.12(B)(2)(3)(b) states that where there are two power sources, the grid and the solar inverter, the sum of their breakers cannot equal more than 120% of the busbar rating of the breaker box. What that means is if you have a typical 200A rated main breaker box, and have a 200A main breaker in it, you cannot add another breaker for the inverter that is larger than 40A, because 200A x 120% = 240A, which is the 200A main breaker plus the 40A inverter breaker. The inverter breaker must be at he opposite end of the breaker box to prevent concentration of the current at one end of the busbar. If both breakers are near each other, the sum can only equal 100% of the busbar. In my example in the photos, my 125A breaker box can have a total of 150A (i.e. 125A x 120%) of source breakers. With a 100A main breaker, and a 30A inverter breaker, I am code compliant with 130A total (100A main breaker + 30A 2-pole inverter input breaker). That 30A breaker can handle a 5700W inverter. Since a grid-tie inverter is generally running more than 3 hours, it is considered continuous load. NEC requires the breakers be sized at 125% of the inverter’s rated output. 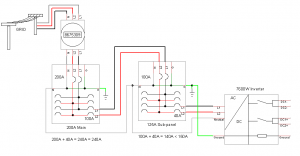 So a 7680W inverter that outputs 240V, outputs 32A (7680W ÷ 240V = 32A). That requires a 40A breaker (32A x 125% = 40A). Therefore, a 10kW inverter would need a 60A breaker (10,000W ÷ 240V = 41.6A x 125% = 52.08A, round up to next available size of 60A). 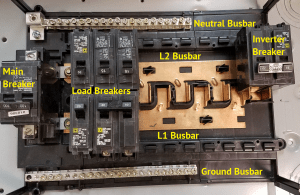 A 200A main breaker and a 60A breaker adds up to 260A, which is 130% of the rated busbar, and not allowed. It gets even worse if you have a 100A breaker box, you are limited to only adding a 20A breaker for a 3800W inverter. Note that this restriction does not include the breakers that are used by your loads, only breakers that are for a power source, like the grid and inverter. So, what options do you have if you want to install a solar grid-tied inverter in a home with a 200A rated main breaker box? If a 7680W inverter like the SMA SunnyBoy 7.7kW Inverter isn’t big enough for you, there are basically three solutions, with pros and cons to each. All of the options will require you have the electric company turn off power to your house while the work is being done, so make sure you coordinate with them. The goal for a 200A breaker box is to keep the sum of the main breaker and the inverter breaker at or under 240A. If you need to add a 60A breaker for the inverter, you could swap out your main 200A breaker for a 175A breaker. That then gives you 175A + 60A = 235A, which is less than 240A. This may be the least expensive option, but it is not ideal. The downside is that you will now restrict the amount of current allowed to and from the grid. If you have high energy loads all come on at once, you may have a nuisance trip on your main breaker, where it used to be able to handle the loads just fine with the bigger breaker. If you do have high loads and you cannot reduce your main breaker with a lower amperage, you could replace the whole breaker box with a 400A breaker box. This will give you the ability to add up to 80A for the inverter(s), giving you over 15kW of solar power. Unfortunately, this is the most expensive option, as you need to buy a new breaker box for thousands of dollars, coordinate with the electric company to temporarily turn off your service and most likely hire an electrician to make the swap. This entails moving all of the circuits from the old box to the new box, a very labor intensive project, if the existing wires are even long enough to do it. An increasingly common solution is known as a Line Side tap, a.k.a. Supply Side tap. This work is usually done by a licensed electrician. The main breaker box is completely bypassed, and a fused AC Disconnect is used to connect the inverter to the grid between the utility meter and the main breaker box. This removes most restrictions imposed by the breaker box, as long as the main breaker is big enough to receive the power from the inverter. 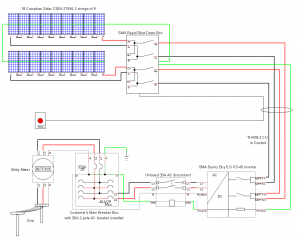 Solar power from the inverter is either sent back into the main breaker box through the main breaker, same as the grid power, or it is sold to grid. Line side taps do not interfere with net metering or Feed-in Tariffs (FiT), although an additional meter may be required as a dedicated production meter. This production meter will measure all of the solar power generated, regardless of if you use it or sell it. Unlike the bi-directional net meter, it only spins forward, counting the Wh you made with the sun. The electric company would be required to agree to this configuration, some companies do not like their clients doing a Line-side Tap. An additional twist can be presented if the inverter is being fed into a sub-panel, for example in a barn, which is fed from the main breaker box. What breakers need to be included in the calculations? The breaker from the main feeding the sub-panel? The main breaker in the sub-panel? There used to be a bit of confusion about this, but it was cleared up in NEC 2014. The inverter breaker in the sub-panel is the breaker to use in the calculations. For example, picture a 200A main breaker box feeding a 125A sub-panel through a 100A breaker, with a 100A main breaker in the 125A sub-panel. That sub-panel can have a 40A breaker added to it for the 7600W inverter, as 100A + 40A = 140A, which is under the 150A restriction. Carry that 40A upstream to the 200A main breaker box, that equals 240A total, and is allowed with the 240A restriction. So now that you understand NEC705.12, you can decide which option works best for your solar system.